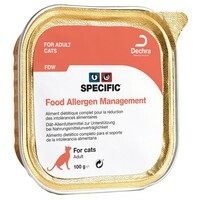 Specific Food Allergen Management FDW Wet Food Trays for Adult Cats are nutritionally complete meals developed to help cats with food sensitivities and allergies. Designed to help reduce ingredient and nutrient intolerances, and compensate for maldigestion, Specific Food Allergen Management has been made with only a single protein source and high-quality ingredients that are less likely to cause an allergic reaction. Lamb, Rice, Sunflower Oil, Minerals, Vitamins and Trace Elements (including Chelated Trace Elements), Psyllium Husk , Dextrose, Xylose, Taurine, Methionine.